It wasn’t but a few weeks ago that I reviewed the 0.5 mm Purple Color Series Jetstream and as I am known to do, I picked up several other colors of the same pen to see how they perform. The Orange Color Series is the latest to be put to the test. I went with the same 0.5 mm size as the purple to get a feel for how similar sizes compared and I am not as big a fan of the orange as I am the purple. I’m not sure what my expectations were - I’ve reviewed the original Color Ink Series Orange Jetstream in the past and enjoyed it - but the latest version is too light for me. I felt like I had to strain too much to see the ink color. On a related note, I did go to the eye doctor yesterday. I passed on the Lime Green Color Series because I thought it would be too light. It turns out the orange is in the same boat. The 0.7 mm is probably a better choice for me in this color. The lyrics in the review are from R.E.M.’s “Sitting Still”. Growing up in the South in the 80’s it was a rite of passage listening to Stipe, Mills, Buck, and Berry and I am passing that along to my kids. The problem is - as with many of Stipe’s lyrics - they are incoherent at best and I have a tough time trying to explain them to my daughter. “Sitting Still” is widely know as the best of the worst of Stipe’s lyrics. Even he admits he has no idea what he is saying. If you use Rdio, listen to the live version found on “Live At The Olympia”. Stipe jokes at the end of the song about fans trying to search for lyrics on the internet. I wonder why??? 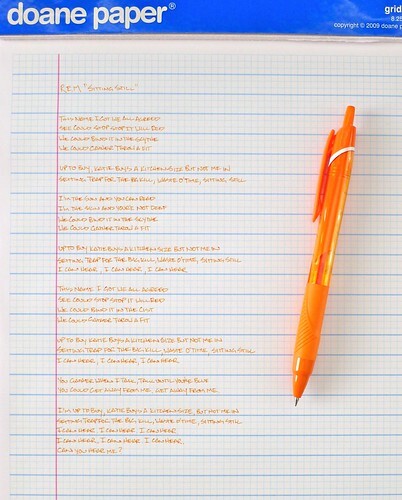 Posted on May 11, 2012 by Brad Dowdy and filed under Jetstream, Pen Reviews, Uni-Ball.